When worn as a set, this 14k white gold pair has a total of 8 round diamonds and 28 round blue sapphires. The stones are arranged in diagonal rows wrapping around the tops. 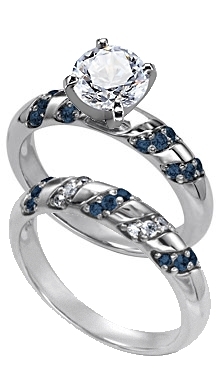 This classy design lends itself to a variety of center diamond shapes. You choose the center diamond from Danforth's inventory.